Learn how to earn athletic scholarships and grants for college and fulfill your dream of playing college basketball! If you're a high school athlete interested in playing at the next level, there are some secrets you need to know that could actually get your college paid for! See how to navigate the college basketball recruiting process and attend the school of your dreams. Well, the value of a scholarship completely depends on the school that offers it. Athletic scholarships for both NCAA Division I and II schools are partially funded through revenue distribution from the NCAA, but it's up to each school to administer and award its own basketball scholarships. The NCAA determines a maximum number of scholarships that can be awarded in each sport. However, each college athletic program sets its own budget and decides how many scholarships it can afford to offer in each sport. Institutions with bigger budgets are able to offer more scholarships than other schools, but they all have to stay within the NCAA team scholarship limits. To get an idea of the value of college basketball scholarships, here are some numbers put out by the NCAA. At an in-state public school in 2008, a full scholarship was worth around $14,000/year. A full scholarship for an out-of-state public school was valued at $24,000/year. A full scholarship at a private school was closer to $32,000/year. Multiply each of those amounts times 4, and you can see for yourself the tremendous value of a 4-year scholarship. I was fortunate to attend school on a full basketball scholarship. It was such a great feeling to graduate without a penny of student loan debt along with having the incredible experience of playing college ball. For me, it was well worth the effort! 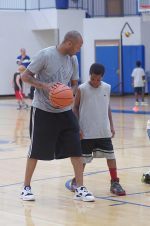 What Do Basketball Scholarships Cover? A full college basketball scholarship covers all actual educational costs. This includes tuition and fees, room and board, and all required books and supplies. Partial scholarships are full scholarships that are divided among several players. A partial scholarship will only cover a portion of the educational costs. There are players who receive a percentage of a scholarship, like a 50% or a 3/4 scholarship. Players might also receive only room and/or board, or they might only receive books. It's really up to the individual program to decide how they want to split up the allotted scholarship money they have. By giving less money to each student-athlete, they are able to provide financial assistance to more players. Basketball scholarships are award on a year-to-year basis. There is no such thing as a guaranteed 4-year scholarship. Every year, the coach and player have to decide if they want to renew the scholarship for the next year. NCAA Division III schools do not offer athletic scholarships and grants for college, but players in those programs often receive other types of financial aid like academic scholarships.